Microstructures, electronics, nanotechnology - these vast fields of research are growing together as the size gap narrows and many different materials are combined. Current research, engineering sucesses and newly commercialized products hint at the immense innovative potentials and future applications that open up once mankind controls shape and function from the atomic level right up to the visible world without any gaps. Sensor systems, microreactors, nanostructures, nanomachines, functional surfaces, integrated optics, displays, communications technology, biochips, human/machine interfaces, prosthetics, miniaturized medical and surgery equipment and many more opportunities are being explored. 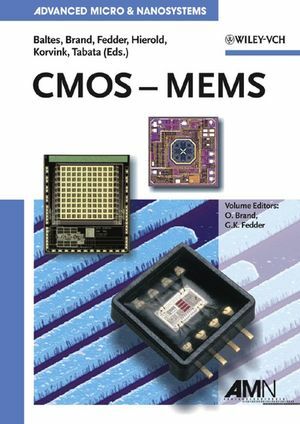 This new series, Advanced Micro and Nano Systems, provides cutting-edge reviews from top authors on technologies, devices and advanced systems from the micro and nano worlds. Henry Baltes is Professor of Physical Electronics at ETH Zurich since 1988. He is the Director of the Physical Electronics Laboratory active in CMOS-based bioelectronic, chemical, and physical micro and nano sensor systems and a co-founder of the spin-off company SENSIRION. He held visiting appointments at Stanford University, the University of Waterloo, Ritsumeikan University, the University of Bologna, and the University of Freiburg. Prior to 1988, he held the Henry Marshall Tory Chair at the University of Alberta, where he was Acting President of the Alberta Microelectronics Centre and co-founder and Director of LSI Logic Corporation of Canada. From 1974 to 1982 he worked for Landis & Gyr Zug (now Siemens) Switzerland, where he directed the solid-state device laboratory. He received the D. Sc. degree from ETH Zurich in 1971. Henry Baltes is a Fellow of the IEEE and a Member of the Swiss Academy of Technical Sciences. He received the European Science Award of the Koerber Foundation, the Wilhelm Exner Medal of the Austrian Trade Association, and honorary doctoral degrees of the University of Waterloo and the Alma Mater Studiorum University of Bologna. Oliver Brand is an Associate Professor in the School of Electrical and Computer Engineering at the Georgia Institute of Technology, Atlanta, USA. He received his diploma degree in Physics from Technical University Karlsruhe, Germany in 1990, and his Ph.D. degree (Doctor of Natural Sciences) from ETH Zurich, Switzerland in 1994. Between 1995 and 2002, he held research and teaching positions at the Georgia Institute of Technology (1995-1997) and ETH Zurich (1997-2002). Dr. Brand has co-authored more than 100 publications in scientific journals and conference proceedings and two books. His research interest is in the areas of CMOS-based micro- and nanosystems, MEMS fabrication technologies, and microsystem packaging. Dr. Brand is on the editorial board of Sensors and Materials and has served on the program committees of a number of conferences, including MEMS and Eurosensors. Gary K. Fedder is a Professor at Carnegie Mellon University where he holds a joint appointment with the Department of Electrical and Computer Engineering and the Robotics Institute. He received the B.S. and M.S. degrees in electrical engineering from MIT in 1982 and 1984, respectively. From 1984 to 1989, he worked at Hewlett-Packard on a VLSI IC tester and on modeling printed-circuit-board interconnect for high-speed computers. He received his Ph.D. in 1994 from U.C. Berkeley, successfully demonstrating the first microstructure with sigma-delta multi-mode electrostatic servo control. He is a subject editor for IEEE J. MEMS and on the editorial board of IoP J. Micromech. and Microengineering. Professor Fedder's research interests include microelectromechanical systems (MEMS) modeling, simulation and synthesis, integration of MEMS and CMOS, microsensor design, microactuator control systems, and probe-based data storage. Christofer Hierold holds the Chair of Micro- and Nanosystems at the ETH in Zurich, Switzerland, since April 2002. Prior to that, he spent eleven years with Siemens AG and Infineon Technologies AG, responsible for R&D on microsystems, advanced CMOS processes, memories, nanoelectronics and new materials. During his time in industry, his major research and development achievements were in the field of CMOS compatible microsystems, such as fully integrated, surface micromachined intelligent CMOS pressure sensors and fingertip sensors. His current research work focuses on the evaluation of new materials for MEMS, on advanced microsystems and on nanotransducers. Professor Hierold holds numerous patents and has published over 20 research articles in peer reviewed journals and international conference proceedings. He served on the program committees of several scientific conferences, MEMS and IEDM amongst others, and is also in the International Steering Committee of the European Conference on Solid-State Transducers. Jan G. Korvink holds a Chair for Microsystem Technology at Albert Ludwig University in Freiburg, Germany, where he runs the laboratory for microsystem simulation and also serves as the Dean of the Faculty of Applied Science. Prior to that, he worked at the Physical Electronics Lab, Institute for Quantum Electronics of the ETH Zurich, where he built up and led the microsystem modelling effort. Three of the MEMS simulation programs that were developed by him and his group during this time were successfully commercialized. He has co-authored more than 100 papers in scientific journals and conference digests, as well as numerous book chapters and a book on semiconductors for engineers. He stayed at Ritsumeikan University in Shiga, Japan, and the ETH Zurich as visiting professor, served as European editor for Sensors and Materials and on both the IEE MEMS and IEEE IEDM committees. Professor Korvink currently serves on the committees of a number of conferences related to MEMS, including Eurosensors, DTIP, ESSDERC, and the MSM. His research interests cover the modeling and simulation of microsystems and the low cost fabrication of polymer-based MEMS. Osamu Tabata received his M.S. and Ph.D. degrees from Nagoya Institute of Technology, Nagoya, Japan, in 1981 and in 1993, respectively. From 1981 to 1996, he performed industrial research at Toyota Central Research and Development Laboratories, Inc., in Aichi, Japan. In 1996, he joined the Department of Mechanical Engineering of Ritsumeikan University in Shiga, Japan. He spent three months each as Guest Professor at the Institute of Microsystem Technology, Freiburg University, Germany, in 2000 and at ETH Zurich, Switzerland, in 2001. In September 2003, he joined the Department of Mechanical Engineering, Kyoto University, Kyoto, Japan. Professor Tabata is currently engaged in the research of micro/nano processes, the LIGA process, MEMS and micro/nano system synthetic engineering (SENS). He serves as an associate editor of J. MEMS and is on the editorial boards of several journals, and a program committee member of numerous international conferences. He was honored with the Science News Award in 1987, Presentation Paper Award in 1992, and received the R&D 100 Award in 1993 and 1998.